"Living Room" redirects here. For other uses, see Living Room (disambiguation). 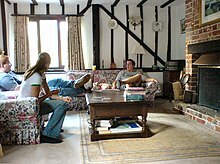 In homes that lack a parlour or drawing room, the living room may also function as a reception room for guests. 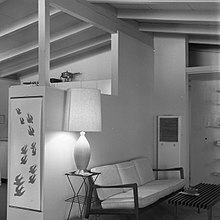 Objects in living rooms may be used "to instigate and mediate contemplation about significant others, as well as to regulate the amount of intimacy desired with guests." Until the late 19th century, the front parlour was the room in the house used for formal social events, including where the recently deceased were laid out before their funeral. The term "living room" is found initially in the decorating literature of the 1890s, where a living room is understood to be a reflection of the personality of the designer, rather than the Victorian conventions of the day. ^ Martin, Judith (2003). Star-spangled manners: in which Miss Manners defends American etiquette (for a change). New York: W.W. Norton & Co. p. 264. ISBN 0-393-04861-6. ^ Rechavi, Talya B. (March 2009). "A Room for Living: Private and Public Aspects in the Experience of the Living Room". Journal of Environmental Psychology. 29 (1): 133–143. doi:10.1016/j.jenvp.2008.05.001. ^ Halttunen, Karen (1989). "From Parlor to Living Room: Domestic Space, Interior Decoration, and the Culture of Personality". In Bronner, Simon. Consuming Visions: Accumulation and Display of Goods In America 1880–1920 (1st ed.). New York: Norton. ISBN 0-393-02709-0.